ROGER Varian expects ground conditions to suit the prolific Pilaster in today’s DFS Park Hill Stakes at Doncaster. Pilaster faces six rivals in the one-mile-six-furlong Group Two, with the field headed by the Andrew Balding-trained and Oisin Murphy-ridden Horseplay. 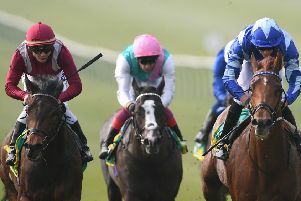 The filly won the Lancashire Oaks in July before finishing a creditable fourth behind Sea Of Class in last month’s Yorkshire Oaks. Meanwhile, Leyburn trainer Karl Burke relies upon Divinity in the May Hill Stakes for two-year-old fillies, a contest that he won last year with subsequent Group One heroine Laurens.